Umcka ColdCare Sugar-Free Grape Syrup / 4 oz - Nature's Way®. The right traditional roots extract addresses the cause. Pelargonium sidoides 1X – the main ingredient in Umcka ColdCare. That means you’re getting a homeopathic medicine that works safely with your body – not against it. 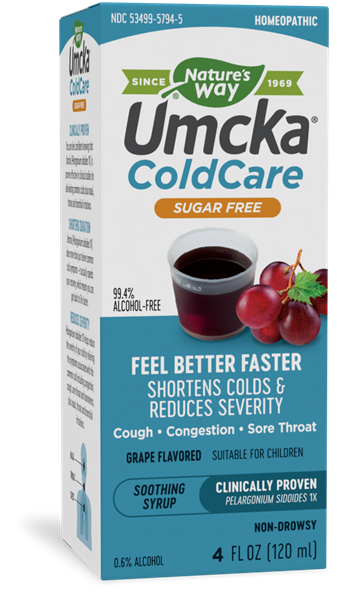 Why Umcka ColdCare Sugar-Free Grape Syrup? Good for coughs and sore throat – especially in children! You can feel confident knowing that Umcka (Pelargonium sidoides 1X) is proven effective in clinical studies for alleviating common colds plus nasal, throat and bronchial irritations. Use only with enclosed dosage cup. Adults & children 12 years of age and older: Take 1 1/2 teaspoons (tsp) (7.5 mL) 3 times daily.